Finding Yoga | The birth of Like (totally) Zen: Meditation, for people who don’t meditate. The birth of Like (totally) Zen: Meditation, for people who don’t meditate. 07 May The birth of Like (totally) Zen: Meditation, for people who don’t meditate. When I was about nine years old, I dragged my Mum and my younger sister to a meditation session at a festival in the south west of Western Australia. I remember being surprised at finding a room full of people sitting cross-legged in complete silence. As my mother then tried to discreetly guide us out of the wood-cabin, the meditators remained still and, at least on the surface, non-perturbed by the interruption. Somehow, before the age 10, I’d become a fan of Shaktwi Gawain and her beautiful exercises in creative visualisation. I had also become accustomed to the relaxation exercises my Mum had learnt at drama school and would do with us at night to help us sleep. It wasn’t until my early 20s, when I suffered from what is usually diagnosed as Chronic Fatigue Syndrome (the free e-book on my experience recovering from that is available here) that I started practising more traditional methods of meditation (in contrast to relaxation or visualisation). Meditation was a key part of my recovery from this period of constantly being unwell. It helped me relax my body, calm my mind, and have clarity in the way I viewed the world. In the years that followed I learnt more about the different philosophies behind meditation and the western sciences understanding of why it works. There is a science to it, and the science definitely deepens your practice. But you don’t need to know the science to get started. Beginning simply allows you to build up a basic toolbox of skills, techniques and experiential knowing. Your body and your mind get used to moments of pause. They relax and centre more easily, and you learn to be present, easily and effortlessly. After watching loads of people think about starting meditation and either not start, or not keep it up, I decided to write a real beginners’ guide to starting. I wanted to create something that inspires you to just get going. No pages of theory, no need to set aside an evening to visit a meditation centre. Something that anyone can do, even if you’re really, really busy. 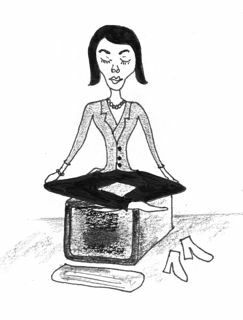 And that’s why I wrote Like (totally) Zen – Meditation, for people who don’t meditation. I bashed out the first version in a café in a random French city last summer and it’s finally ready to be launched. Five copies will be available for free for five people as an e-book on Saturday May 14. If you’d like to be one of these (supremely lucky!) five, stay tuned for how to let me know you’re interested. I’m currently dreaming up a challenge – if you have ideas, do let me know. Thanks for reading, and have a wonderful day.